President Trump's manufacturing council keeps on shrinking. The number of council members who have quit following Trump's remarks about white supremacists has risen to six after one of the country's most powerful labor union leaders said he was stepping down. Richard Trumka, leader of the AFL-CIO, issued a statement on Tuesday saying "I cannot sit on a council for a President that tolerates bigotry and domestic terrorism." His resignation came shortly after Trump told reporters on Tuesday that "both sides" were responsible for violence at a white supremacist rally in Charlottesville, Virginia. Thea Lee, an economist and former deputy chief of staff at the AFL-CIO, also resigned from the council. Four business leaders had already walked away from Trump's manufacturing council following the president's reaction to the protests in Charlottesville. Scott Paul, head of the Alliance for American Manufacturing, quit Trump's manufacturing council earlier on Tuesday. He said on Twitter it was "the right thing for me to do." He joined the CEOs of Merck, Under Armour and Intel, who all left the council Monday. The group, which Trump established in January with about two dozen members, is supposed to meet occasionally to offer the president advice on job growth. At least 17 members remain on the council, nine of whom have said this week that they are staying. Trump said on Twitter that he has other CEOs ready to step in and that "grandstanders" should not have joined the manufacturing council in the first place. The aftermath of the violence at a neo-Nazi and white nationalist rally represents the latest break between Trump, who sold himself as a businessman president, and leaders of corporate America. They have also loudly opposed him on immigration and his decision to pull the United States out of the Paris climate agreement. First to leave the manufacturing council after Charlottesville was Kenneth Frazier of Merck (MRK), one of the most prominent black executives in the United States, who said the nation's leaders "must honor our fundamental values by clearly rejecting expressions of hatred, bigotry and group supremacy." Frazier, who as a lawyer helped free a black death row inmate falsely accused of murder, and who now leads one of the country's most powerful drug companies, was first to quit the manufacturing council. "America's leaders must honor our fundamental values by clearly rejecting expressions of hatred, bigotry and group supremacy," he said in a statement. Within minutes, Trump responded by bashing Frazier on Twitter. The president wrote that the Merck CEO "will have more time to LOWER RIPOFF DRUG PRICES!" After neo-Nazis and white supremacists brawled with counter-protesters in the streets of Charlottesville on Saturday, Trump spoke against violence "on many sides -- on many sides." A woman was killed and 19 people injured when a car rammed down a narrow street. Two days later and after intense criticism, Trump on Monday called out the KKK, neo-Nazis and white supremacists as "evil" and "hate groups" that are "repugnant to everything we hold dear as Americans." Kevin Plank, the CEO of Under Armour (UA), quit the council later in the day. "Under Armour engages in innovation and sports, not politics," he said in a statement. He said he would "continue to focus my efforts on inspiring every person that they can do anything through the power of sport which promotes unity, diversity and inclusion." Intel (INTC) CEO Brian Krzanich was somewhat more direct. "We should honor -- not attack -- those who have stood up for equality and other cherished American values. I hope this will change, and I remain willing to serve when it does," he wrote in a blog post on the company's website late Monday. "I resigned because I want to make progress, while many in Washington seem more concerned with attacking anyone who disagrees with them," he said. 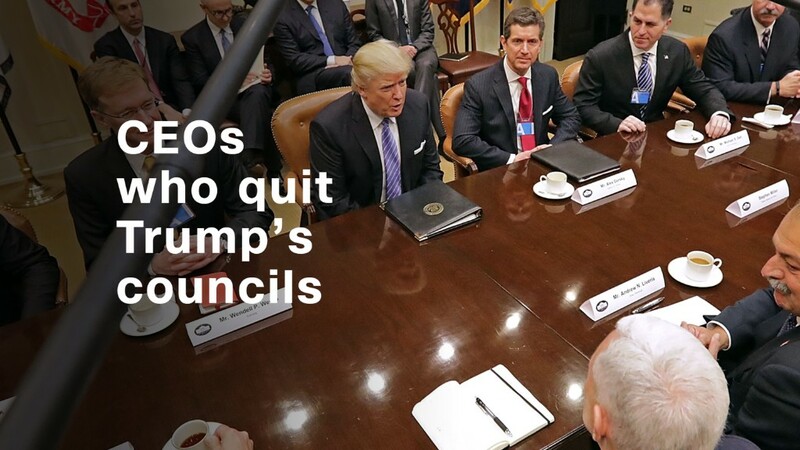 A number of companies or executives said they would remain with the council, which was formed in January to advise Trump on manufacturing growth -- a focus of the president's campaign. General Electric (GE) said the company has "no tolerance for hate, bigotry or racism." But it added that chairman Jeff Immelt would stay on the council because it was important for GE to "participate in the discussion on how to drive growth and productivity in the U.S."
Representatives for at least five other companies -- Dow Chemical (DOW), Whirlpool (WHR), Campbell Soup (CPB), International Paper (IP) and Nucor (NUE) -- voiced similar sentiments. They all released statements that condemned racism or welcomed tolerance. But they also said they'd stay on the council so they could advise the government on ways to strengthen manufacturing.